Annie Clara (Bielecki) was born December 9, 1928. She was the second child of seven (Frank, Annie, Peter, John, Joe, Mary, Robert) born to Paulina (Zac) and Joseph Bielecki. Annie attended the White Eagle School up to grade 8 and then quit to help on the family farm. Eventually she moved away from home and worked at Jumping Pound Ranch in Jumping Pound, Alberta, near Calgary. She also worked on the Fuchs’ farm, which she found quite intriguing with all of those animals watching her. She worked in the Paradise Hill Hospital for 8 years. 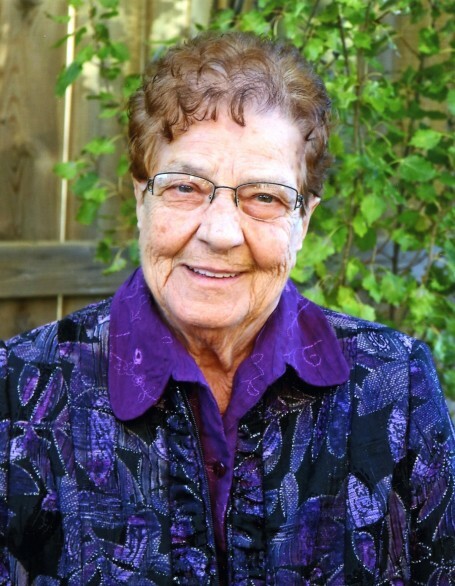 Annie attended an Agricultural Youth Training School in North Battleford in 1950. Annie married Albert Salzl on November 21, 1960 and they resided in Paradise Hill while grain farming approximately 3 miles south of Paradise Hill. They were unable to find water on the farm so they lived in Paradise Hill. They continued to farm from 1960-1985. After this time they semi-retired while renting the land out and in 1989 they retired fully. The first and only child born to Annie and Albert was a daughter, Joyce Janet, on August 26, 1963. On June 1, 1991 Joyce married Terry Borzel. In September 1992, her husband Albert passed away. In 1993 her granddaughter Kaitlyn was born, followed by her grandson Troy in 1994. These two grandchildren were Annie’s pride and joy. Annie moved to Lloydminster in 1997 where she lived only a couple blocks from her family. She spoiled not only the grandchildren but Joyce and Terry, as well as anyone else that stopped by, with home cooked meals, endless baking and fresh garden supplies. In 1998, she missed her gardening and that is when she decided to invest in a bigger cabin at Little Fishing Lake. In 1999 it was the first summer she lived at the lake and she enjoyed her gardening again along with all of the wildlife that would come by. Some springs and falls were so beautiful that she extended her stay from May to October. She continued this up to 2015, and in the following years she went only when the rest of the family would go. This past summer she found a crab apple tree growing in the back yard at the lake which never produced apples before. Finally, a crab apple tree of her own to enjoy. Having used about two-thirds of the apples, and saving the last third for a final picking, she found out you should not leave unpicked apples too late in the fall. Lesson learnt, the Bear got the last third of the apples as they watched from the vehicle as he sat on the neighbours fence eating them. The family pet Reba, a Shih Tzu also became a good friend of Grandma Ann. Reba chose to spend the summers at the lake with her and the two were inseparable. Better yet were the days Kaitlyn and Troy got to spend time with Grandma and Reba at the lake. Annie also enjoyed knitting and crocheting, and continued with her passion of baking, which her family was grateful for. She has a cookbook collection that has come from far and wide. Annie will be sadly missed by Joyce, Terry, Kaitlyn and Troy, but Reba will be excited to have her friend back by her side, as she passed away this past December. Annie leaves to mourn: her daughter, Joyce Salzl-Borzel (Terry); her granddaughter, Kaitlyn Salzl-Borzel; her grandson, Troy Salzl-Borzel; her brothers, Frank (Frances) Bielecki and John Bielecki; her sisters-in-law, Rose Bielecki, Cathy Bielecki, Jane Salzl, Lucille Salzl, and Lyla Salzl; her brother-in-law, Anthony Salzl; and several nieces and nephews. Annie was predeceased by: her parents, Joe and Paulina Bielecki; her husband, Albert Salzl; her sister, Mary Bielecki; her brothers, Peter Bielecki, Joe Bielecki, and infant brother Robert Bielecki; her sisters-in-law, Denise Bielecki, Josie Bielecki, Rosie Ulrich, Anne Salzl, Lucy Salzl, and Shirley Salzl; her brothers-in-law, George Salzl, Norman Salzl, Martin Salzl and Lawrence Ulrich; her nephews, Gordon Bielecki, Ted Bielecki and Greg Salzl; and her great niece, Christina Rammel.